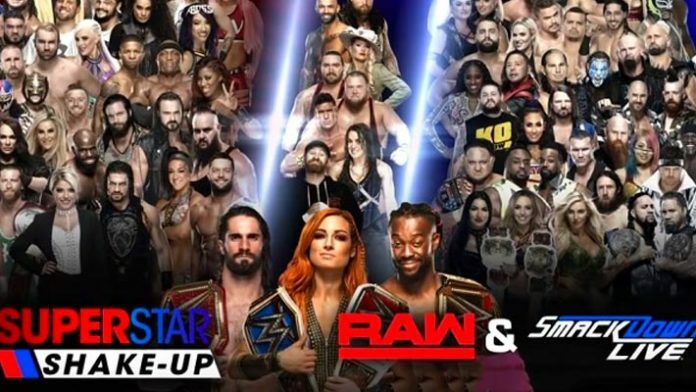 The 2019 WWE Superstar Shakeup continued Tuesday night on SmackDown Live. Many of SmackDown’s top stars moved to Raw Monday night, including AJ Styles, Rey Mysterio, The Usos, The Miz and more. Click here to see a full breakdown of Superstar Shakeup Night 1 results. Intercontinental Champion Finn Balor is the first Raw Superstar to move to SmackDown. The opening segment of SmackDown Live saw Kevin Owens hosting the Kevin Owens Show with guests Kofi Kingston and Xavier Woods. Owens aligned with the New Day members for a 6-man tag match later in the show. Suddenly, Finn Balor’s music played and out came the IC champion. Balor wrestled and defeated Ali in his first match on SmackDown. Lars Sulivan interrupted a promo by R-Truth and Carmella and destroyed Truth. Ember Moon interrupted a promo by Becky Lynch to announce she is now on SmackDown Live. She challenged Lynch, but was interrupted by former Raw Women’s Champion Bayley. Bayley declared she is now on SmackDown as a singles competitor and tried challenging Lynch as well. She was interrupted by the IIconics. Paige then came out to announce the new team she would lead to tag team gold. She was interrupted Mandy Rose and Sonya Deville. Paige said those were not her her new team. The new team is Asuka and Kairi Sane. 205 Live star Buddy Murphy announced he is coming soon to SmackDown Live. Vince McMahon’s big acquisition for SmackDown live was Elias.